The TourismTouchscreen Network is your total solution for visitor information and destination promotion. 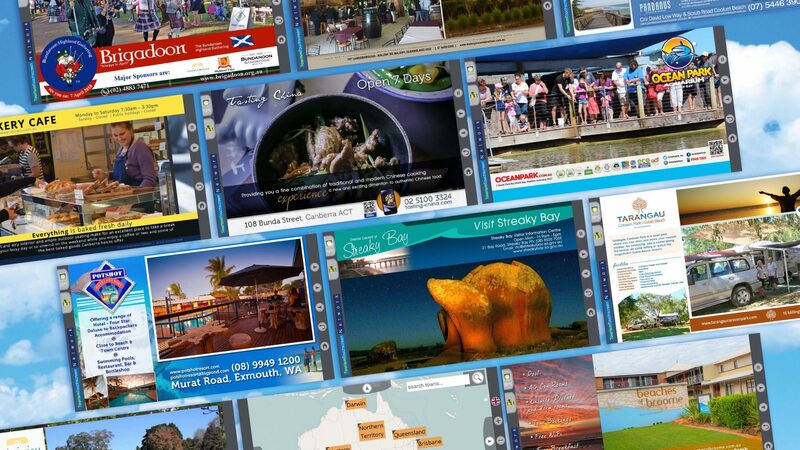 With over 25 years in the industry, an established network of 229 sites and over 2,000 operators, and 24-hour information available in most locations, the TourismTouchscreen Network offers the most complete and far-reaching digital medium in the Australian tourism industry. TourismTouchscreen kiosks are free to use and come in a variety of sizes and formats suitable for any visitor information space. The free-standing Aspire kiosk provides maximum impact with a 32-inch screen and a small footprint. The Quest model can be mounted on a desk, a wall, or even a rotating arm to minimise the space used. Secure afterhours display is available via a through-glass touchpad, so visitors who arrive outside of working hours can still access local information at any time, day or night. State-of-the-art touchscreen hardware is backed up by an intuitive user interface to give users a memorable visitor information experience. Visitors can access local information on attractions, dining options, accommodation, shopping, and services, in just one touch, and discover destinations across the network from any location. The upgraded online TourismTouchscreen Network also provides great web-based features including local weather and mapping, directions to local businesses, and links to the official tourism websites of our partners.